A highlight of each and every year, the 2017 gathering at Pebble Beach in California once again saw the world’s most prestigious automotive brands unveil some stunning concept cars. Amongst them, Mercedes-Maybach unveiled what was almost certainly one of the highlights of the show – the stunning Vision Mercedes-Maybach 6 Cabriolet. Demonstrating Mercedes-Maybach’s quintessential eye for both detail and innovative design, this beautiful concept car is a true look into the future of luxury vehicles. Powered by four compact permanent magnet synchronous electric motors, this fully electric luxury cabriolet features all-wheel drive and a power output of 550kW (750PS). This converts to a 0-62mph sprint of under four seconds and an electronically governed top speed of 155mph. Further to this stunning performance, this solely electric vehicle is capable of a range of over 310 miles courtesy of a shallow battery that sits under the body. 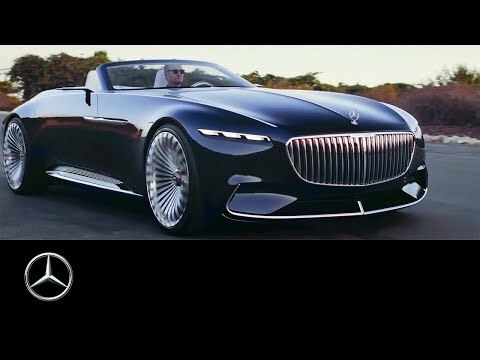 "The Vision Mercedes-Maybach 6 Cabriolet takes modern luxury into the realms of the ultimate in luxury, and is the perfect embodiment of our design strategy. Breathtaking proportions combined with a luxurious "haute couture" interior help to create the ultimate experience"
Again, the inspiration from the world of luxury yachts can once again be felt thanks to the flowing design that dominates the entire interior. As you’d expect, only the very best materials have been used throughout. Utilising the brand’s hallmark materials, the Vision Mercedes-Maybach 6 concept car features rose gold on the trim elements, quilted crystal white nappa leather and an open-pore wood floor with inlaid aluminium. Being a cabriolet, this particular concept car heightens the theatre created by the luxurious interior even further with the capacity for open top driving. Regardless of the roof configuration, occupants would have access to a host of technologies that are aimed at making the journey as comfortable as possible without the driver ever having to remove their attention from the road. Accomplished through technologies such as touch-only control, intelligent navigation linked to the appointment calendar, voice commands through the Concierge function and even biometric sensors that monitor the state of mind and health of occupants, Vision Mercedes-Maybach 6 aims to anticipate and cater to the needs of the driver and passenger instantly. Unfortunately, Vision Mercedes-Maybach 6 Cabriolet is currently only a concept car; however, the design and innovation that it demonstrates for the future of luxurious travel is certainly exciting. What are your thoughts on this beautiful new concept car? We’d like to hear your view on Facebook. New Rules look to remove the Cyber Threat to Autonomous Cars. We're proud to offer the entire range of current Mercedes-Benz products.